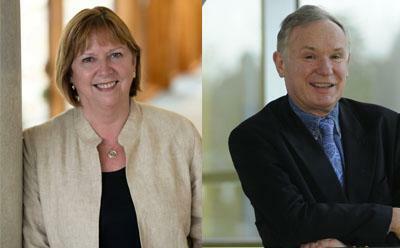 Professors Dame Wendy Hall and Sir David Payne head a list of luminaries from the University of Southampton named amongst the 500 most influential people in the UK for 2017. Dame Wendy, Sir David and nine others with close ties to the University have made the Debrett’s Most Influential 500 through their influence in shaping the lives, choices and ideas of others. Dame Wendy and Sir David are joined by Visiting Professor Liam Maxwell alongside Southampton graduate and Chair of Crossrail, Andrew Wolstenholme OBE, on the Debrett’s Most Influential 500 list for Engineering and Technology. Fellow graduates Justine Greening MP, the UK’s Secretary of State for Education, and Robert Hicks, Managing Director, Explore Learning, feature on Debrett’s list for Education. World-renowned astrophysicist Professor Dame Jocelyn Bell Burnell, a former academic at the University in the late 1960’s, is listed for Science and Medicine, joined by honorary graduates Sir David Attenborough (Broadcasting), Baroness Martha Lane-Fox of Soho (Digital & Social), Helena Kennedy QC (Law) and Lord Sainsbury of Turville (Philanthropists & Activists). Described by Debrett’s as “a leading light in the development of web services”, Dame Wendy Hall is recognised for her pioneering role as one of the first computer scientists to embark on serious research into multi- and hyper-media technologies. Dame Wendy also draws praise as a founding director of the Web Science Research Initiative (now the Web Science Trust) with web pioneer Sir Tim Berners-Lee, an Honorary Professor at the University of Southampton. Liam Maxwell, a Visiting Professor within Electronics and Computer Science, became the UK’s first national technology adviser in 2016 after serving as the government’s Chief Technology Officer. He is credited with the digital transformation of the UK government. As head of Crossrail, Andrew Wolstenholme is in charge of Europe's largest civil engineering project - the high frequency railway for London and the South East due to open in 2018. As programme director of the development of Heathrow Airport’s Terminal 5, he delivered the £4.3 billion project on time and in budget. In 2016, he was appointed Vice-President of the Institution of Civil Engineers, with a view to becoming President in 2019. Justine Greening was appointed by Prime Minister Theresa May as Secretary of State for Education and Minister for women and Equalities in July 2016. Ms Greening, a Southampton graduate with a degree in Business Economics and Accounting, previously served the UK government as Secretary of State for International Development; Secretary of State for Transport and Economic Secretary to the Treasury. While completing her PhD at Cambridge, Dame Jocelyn Bell Burnell discovered pulsars which proved to be one of the most significant discoveries of the 20th century. During her career she has worked at a number of universities including Southampton from 1968-73. 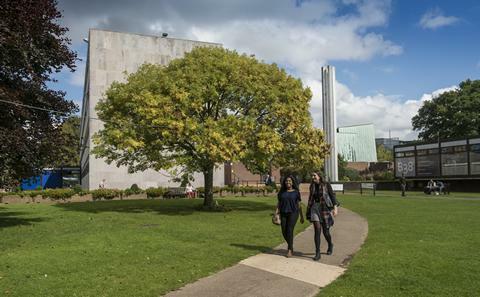 As Managing Director of Explore Learning, Southampton Law graduate Robert Hicks leads a network of 120 maths and English tuition centres across the UK based in ‘easy to reach’ places such as supermarkets and shopping centres and open seven days a week. Sir David Attenborough joined the BBC as a trainee in 1952 before rising to become Controller of BBC 2 and later Director of Programming for BBC Television. He is, perhaps, best known for his work in front of the camera presenting some of the BBC’s best known wildlife and nature programmes over many decades. Baroness Lane-Fox, co-founder of the successful website lastminute.com, is Chair of the digital skills charity Go ON UK and has worked for many years to help make the UK the most digitally-skilled nation in the world. Over the last 30 years, Helena Kennedy has been involved in many of the UK’s most prominent human rights cases including the Brighton Bombing and the Guildford Four appeal. She is currently co-chair of the International Bar Association’s Institute of Human Rights. Lord Sainsbury, former Chair of supermarket chain Sainsbury’s (established by his great-grandfather), served the UK government as Minister for Science and Innovation from 1998-2006. He is currently Chancellor of Cambridge University. Debrett’s Most Influential 500 of 2017 of the most influential and inspiring people living and working in Britain today features a number of luminaries from the University of Southampton. Compiled in consultation with independent expert practitioners and commentators in each of the categories, The Debrett’s 500 was launched in 2014 to identify and celebrate the most influential people in British society.